I am SUPER nervous but I am trying to make the most out of my last day of unemployment vacation. 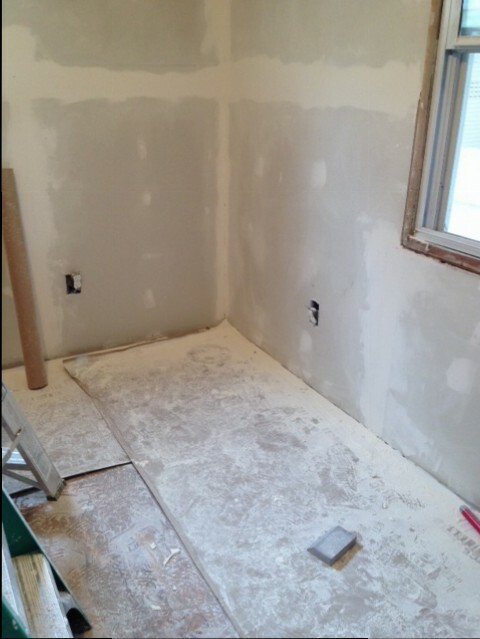 This morning and most days this last week, I got up and went straight to work doing more sanding and mudding on our spare room. Considering we want smooth walls and ceilings, we unfortunately have to repeat this process multiple times until everything is just right. It’s hard work, but will be worth it in the end. 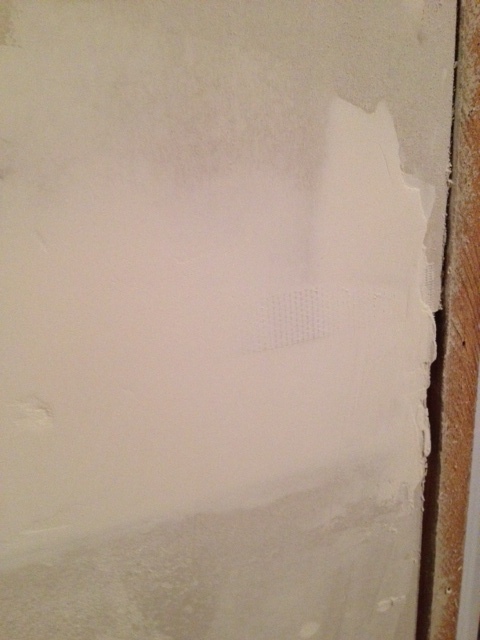 On one of my previous entries titled Spare Room I talked about how mudding is a process in which you try to fill in any holes or gaps on your drywall, including screw holes. Well, sanding helps even all that mudding out. This next photo is exactly what it looks like. 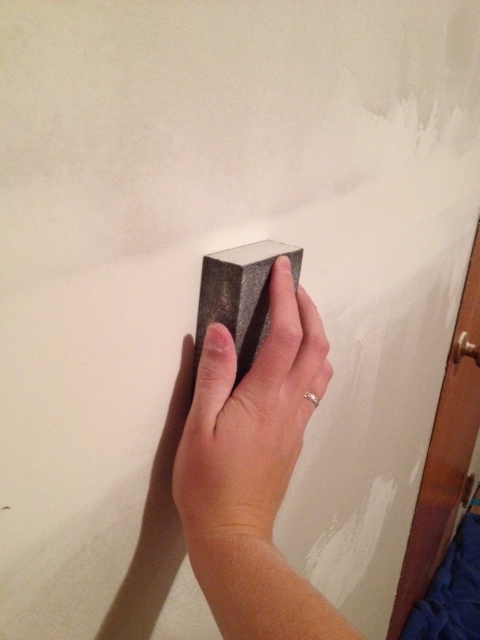 A picture of my hand holding a sanding sponge. But just for reference I wanted to show you how it works. It’s literally that simple. Take the sanding sponge, pretend your one of Mr. Miyagi’s students and do a little “wax on, wax off”. Then, when all is said and done (don’t judge this photo too hard I wasn’t COMPLETELY done with this section) you have a nice, smooth surface! Viola! 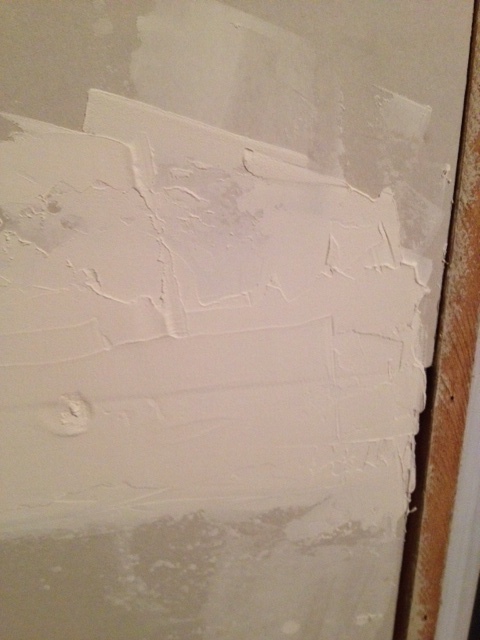 Now go do that to the rest of the walls, ceilings, corners and seams in the entire room until perfect. You’ll be painting in no time! HA! One of the most irritating parts about sanding is the mess. It looks like Christmas came early in our house. Can you imagine living in this? That’s what we did when we first moved in. We were doing the exact same thing to our living room and kitchen that we are doing to our spare room right now. The spare room is better because we can just close the door. But we had to cover furniture and food while working on our living areas. Our only place of sanction at the time was our room that we kept the door closed to so we wouldn’t get as much dust in. It was a nightmare. There is something called wet sanding that we could do but I’ve heard that it’s still pretty dusty and honestly, I don’t want to get water all over our floors as well as the dust. The dust itself is messy but I just feel like things could get worse if I incorporated water into the whole situation. 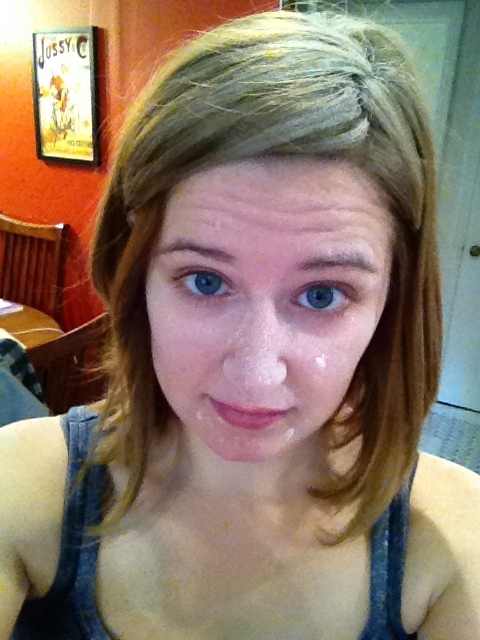 This is me after a good sanding session. You really should be wearing a mask and probably even eye wear for sanding, but we are careless and open a window. The masks start to hurt after awhile. 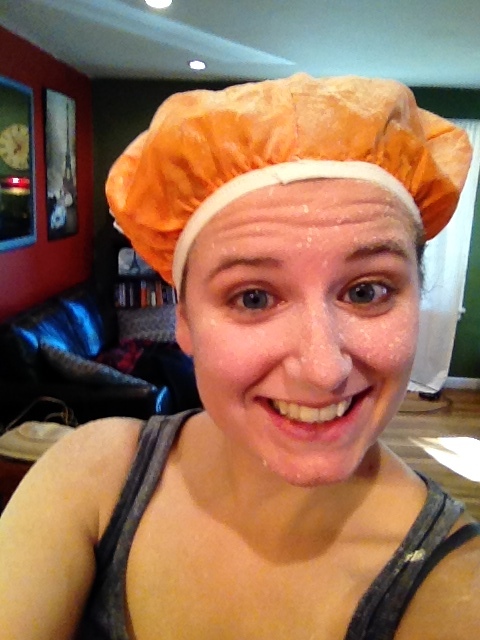 Thanks to the Seattle to Portland bike ride where they handed out some sweet, bright orange helmet covers, I attempted to put one over my head and use it as a shower cap one sanding day so as not to get my hair dusty and have to wash my hair all over again. Although it was successful, the headache and sore skin wasn’t worth it. I’ll deal with the dusty hair from now on. 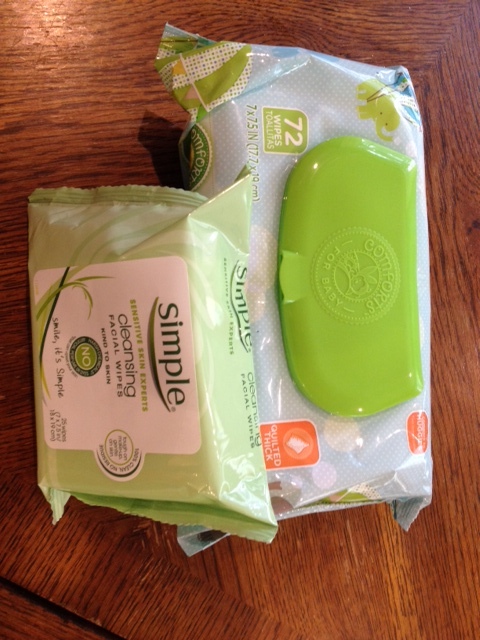 After I sanded the spare room earlier, I went grocery shopping where, based on readers suggestions, I picked up some baby wipes and facial wipes to use after my bike ride to school tomorrow morning. In hindsight I don’t think I need to have gotten these because I called the athletics department earlier and was told that the gym was closed and under construction but would be open on Monday. I can sign up for a lock and as long as I’m a registered student, I can use the facilities. YAY! Well, at least I’ll smell decent this rest of this week. 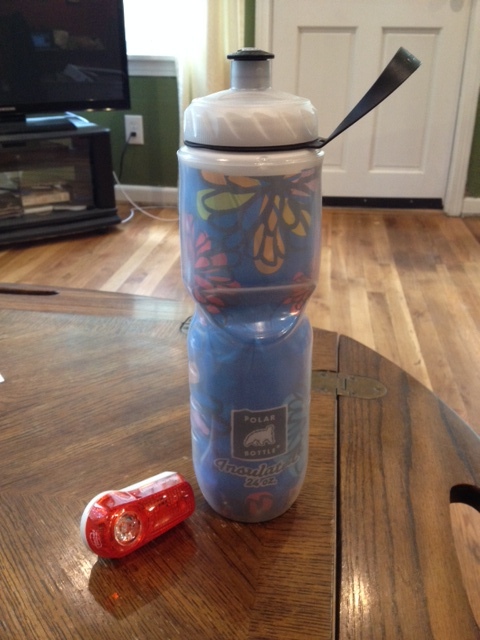 Earlier this week I stopped in at Sports Authority and got this awesome water bottle. Matt prefers them and says they’re perfect for biking – well hell they were even in the biking section. I decided to get this one with flowers on it in case Matt tried to steal my water bottle. I also ordered a light off Amazon last week. I need Matt to put it on my bike – I’m not exactly in the know about taking bikes apart like he is. Wish me luck at school tomorrow. More about the fun projects I did while on my unemployment vacation later! Good luck on your first day tomorrow lady! You’re going to kill it! Also, I love the water bottle! Does it do a good job keeping your water cold?